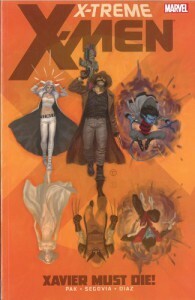 A version of Professor Xavier from another reality pulls together a team of X-Men from various realities in order to hunt down and kill a bunch of evil Xaviers from other realities -- and the only main character from our reality is Dazzler. There's not really a lot going on beneath the surface here, but the surface is so much fun. The art takes a dive toward the cheesecakey and goggles-for-no-reason variety of steampunk in the western story, but still a good time.